It’s about driving change in the organisation using that information and it’s not always easy. It takes effort, it takes perseverance and it takes a focus on change management. Critical to success is a customer feedback governance process for your organisation. I know governance frameworks are boring and nobody wants to talk about them. But governance is the place that we find many organisations have failed in their customer feedback process. The problem is that if you don’t have a governance framework in place, then you’ll never be able to use that information effectively. As a refresher, let’s review the closed loop customer feedback cycle. Measure how well you’re delivering through collecting customer feedback. Pretty much everybody is doing this step. What might surprise you is the second most-important part of the process is the React process, also called the service recovery process. Are you running proactive service recovery based on customer survey feedback? If not you should be because it’s very valuable, but that’s for a post on another day. To do that you need to understand what drives customer loyalty and that’s what Understand is all about. This is where you start to design the changes you want to make in your business. This is the last but most important step. Without Act there is no reason to even collect customer feedback or do any of the other steps. When I talk to most new clients they want to start with Listen and React but best practice is to hold off on that and start by deciding how you’re going to use the information. 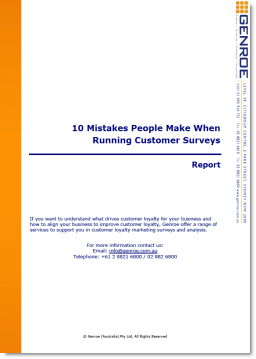 Don’t start by running a customer survey. Use that first wave of energy part to get everybody engaged in the process. This is the governance model we use with organisations. It starts with a Steering Committee which includes the CEO, COO, head of business, whoever it is; it starts at the level in the organisation with complete ownership. The Steering Committee meets maybe once a quarter but it is critical in setting the direction; the goals, the budgets, allocating staff, etc to the customer feedback process. They are not concerned with the detail of how data is collected but they do care how that data is being used to drive change. They’re the people you go to when you want to get approval for the new project, to change how your business operates, etc. At your company they are the senior management group and already exist in your organisation. Approach them and get them engaged in the process through enrolling them in the Steering Committee. The group that probably doesn’t exist at the moment is what we call the Process Team. Their role is critical to your success. This is a mid-tier group of people in the organisation who have the job of understanding and running the customer feedback process on a day-to-day basis. In some organisations this is a stand-alone department. I much prefer to have a cross-functional group: a member from the call centre, someone from operations, shipping, etc. A person from all the different groups that are actually touched by the Process Team. In the cross functional approach it is not their whole job. This is one day a week, maybe it’s two days a week but it’s something they come together and work through as a team. Their goal is to enable the customer feedback process through the rest of the organisation. They have the responsibility for the care and feeding of the data collection infrastructure. They have a deep understanding of customer feedback, or Net Promoter® if that is being used. They understand how the process works and help everybody else to use the information most effectively. An analogy I use is the Accounting Department. The accounting department don’t make sales or ship products but they understand money: they count it, they report on it and they know how to use it most effectively. The Process team count customer feedback, report on it and know how to use it, but the balance of the organisation makes the changes. So these two, the Process Team and the balance of the organisation need to be very closely aligned. They’re the two groups that work together to understand what customers want and make changes in the business. This is also why it is so useful to have cross functional members on the Process Team. It helps to build the links with the rest of the company. Lastly, the Process Team is the key to success of the customer feedback process. When we implement this process for our clients we recommend that they make the members of the Process Team the key focus of the whole game. Make the Process Team an aspirational group. In every company it should be a group that everyone wants to join, not just because they get visibility from senior management, through the Steering Committee, but because they are making things happen. So this is how we suggest organisations configure their Governance process. It works, it keeps the loop closed and it drives long term value from the customer feedback process. Does your governance process look similar or different. Leave a comment and let me know what you have seen work in your organisation. Great content, but does it need to be boring? Let´s make it fun and inspiring to stretch our own capabilities. I do agree things don’t have to be so boring. When we help organisations launch Net Promoter we make sure that the Process Team selects their own name so that can have something more interesting and personal.